Short of prudence, the circumstances in the take-over of a new leadership to run the League of Municipalities of the Philippines-Bohol chapter rocked the boat anew. The fresh squabble cropped up after Gov. Edgar Chatto had sworn in the town mayors elected from the position of executive vice president down to the members of the board of LMP-Bohol during an informal and instant meeting called by Albur Mayor Efren Tungol–in presumed capacity as interim president–after the orientation for the P2.3-billion Bohol Earthquake Assistance fund at the Bohol Tropics on August 4. After the oath-taking, Loon Mayor Peter Lloyd Lopez, as executive vice president, had been assigned to run the LMP-Bohol. The position for president remains to be resolved between Bien Unido Mayor Niño Rey Boniel and Inabanga Mayor Josephine Socorro Jumamoy, who tied with 22 votes each during last year’s election. However, the take-over of Lopez in the leadership of LMP-Bohol surprised Boniel who thought there could be no movement to be undertaken in the light of the status quo order issued by the court. Mayor Boniel also questioned Tungol’s capacity to call the meeting of the LMP-Bohol chapter on August 4, considering that there had been no notices sent to the mayors that about the meeting to be held on that day wherein the agenda could have been conveyed to each member. It turned out that it just came up out of sudden decision that the officers may take oath and for the elected executive vice president to be installed as acting president then. Moreover, the 34 mayors gathered on that day for the orientation for the P2.3-billion Bohol Earthquake Assistance led by the governor and not for a meeting of the league. During that time, Boniel was on vacation in the United States and was supposed to return on August 19 yet based on his leave documents signed by Chatto. Boniel had to cut short his vacation upon learning about the oath-taking of the officers of LMP-Bohol. Mayor Boniel also asked for a copy of the minutes of such meeting on August 4, but the office staff of LMP-Bohol said there was no minutes and that they had no idea there was such meeting. It was later confirmed that Duero Mayor Conrada Amparo took charge of taking down the minutes. Boniel also lamented that Jumamoy never attempted to raise the concern on its implication to the pending case filed against the LMP-national. Boniel’s camp wanted the court to cause LMP-national to reverse its resolution that nullified the election of LMP-Bohol held on August 9, 2013, so that the attention can be focused on breaking the tie with Jumamoy. The LMP-national cited that Tungol lacked the authority to convene the August 9, 2013 election, because it should have been former Trinidad Mayor Roberto Cajes–being the last chapter president though he was no longer mayor then. For the failure of LMP-national to respond, Boniel’s camp might file for default and call for the declaration of the August 9, 2013 election as valid. Boniel also clarified that he has no qualms as to the good intention of the mayors present during the orientation on the implementing rules of the Bohol Earthquake Assistance fund that they arrived at the consensus that the elected officers except the president should take oath on that very moment. However, the upcoming Visayas cluster conference being the reason is less convincing. Boniel explained that the mayors received individual invitations to the conference and the event does not necessarily require an official leader–be it president or acting president–to represent the LMP-Bohol chapter. Moreover, if the other camp considered it urgent to resolve the impasse, Jumamoy–who is with them–should have given in to the proposal for a toss coin or a term-sharing, according to Boniel. Boniel clarified that from the start, he had always been open to either toss-coin or term-sharing as means to resolve the tie with Jumamoy in the position for president of LMP-Bohol, just so the LMP-Bohol can move on. For her part, Duero Mayor Conrada Amparo said the task assigned to Lopez was just to facilitate the operation of LMP-Bohol and that there was no declaration that the mayor of Loon will serve as “acting president”. This is contrary to what Lopez hinted during an earlier interview last week wherein he assured of a smooth leadership in his “acting capacity”. Until yesterday, no copy of the minutes of the August 4 meeting has reached the camp of Boniel and the mayors in his bandwagon. Then what are the details then of the Orientation of the Bohol Earthquake Assistance? How much went to whom? This is Government money and shall be accounted. 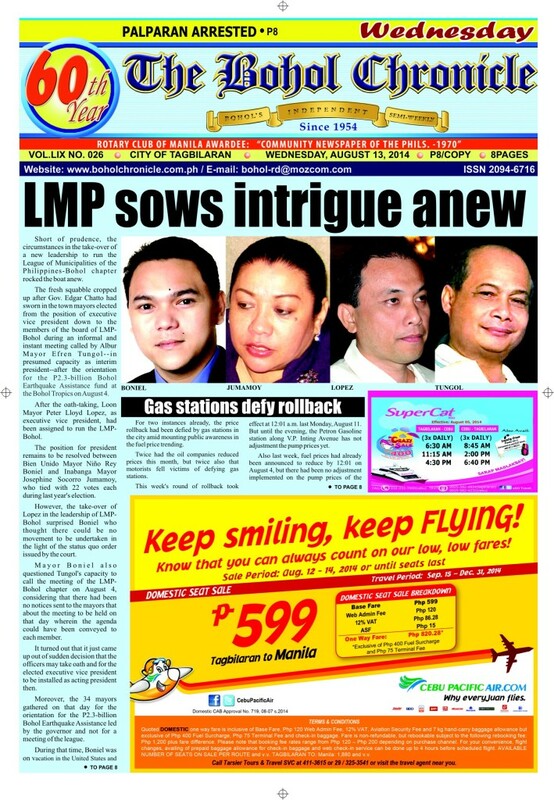 Is LMP an organization or corrupt Mayors? Go back and work to your hometown.